Hi Guys, I’m back again with new trick to run Multiple Accounts in one Android Mobile. 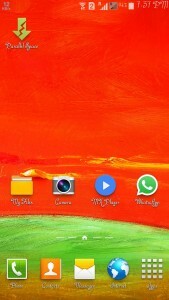 Previously I posted about Double WhatsApp Account without root. Today I will discuss about how to run not only Dual WhatsApp Account in single Android Phone but Dual Facebook, 2 Instagram, 2 Messenger, 2 Twitter Accounts, Multiple Accounts On Clash Of Clans, etc. 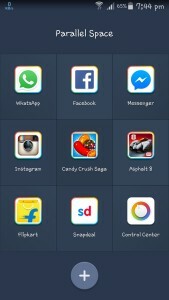 Finally got a App which helps you to create and run Dual Messaging Apps Account, Dual Social Network Apps Account, Dual Gaming Apps Accounts, Dual Play Store and many more dual accounts of different Android Apps. Now a days there is a Trends to Use dual ID’s of same application so you can use this app And Run Multiple account in a single Android Phone. 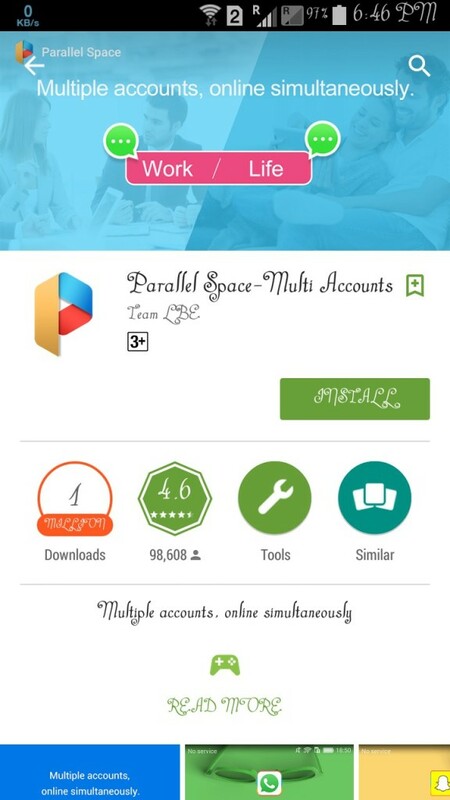 There are so many Apps available to Run Double WhatsApp Account in a single Android Mobile but here I come with Another App name Parallel Space-Multi Accounts which help you to run many Double Android App Accounts. Many People use 2 phones to handle their Work Life and Personal Life separately but now with a single App you are able to manage both or more account separately in one android phone. Parallel Space allows you to run multiple accounts, online simultaneously. Parallel Space creates a separate space in your Android Mobile. 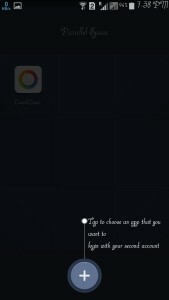 In that space you can run all apps separately, to login to apps second account simultaneously. Unique: Parallel Space allows you to run 2 accounts simultaneously due to its unique separate space technology. 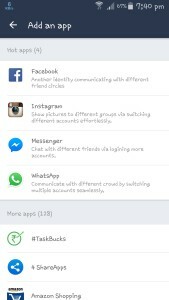 Messenger Apps: Supports all messenger app which helps to connect with different friends at once with 2 accounts. Social Apps: Supports all social app which helps you to share different photos/videos/posts with different accounts. Gaming Apps: Supports all gaming app which helps you to play with 2 accounts and double up your fun at the same time. It supports almost all apps available in Google Play. 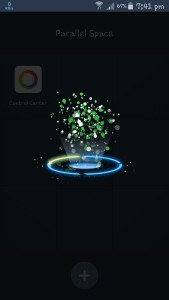 Open Parallel Space App. Click on the + button and add the App whose second account is needed from the given app list that you have installed in your mobile. Now proceed with the simple registration process or sign in on that app. Now you have 2 accounts of that app. 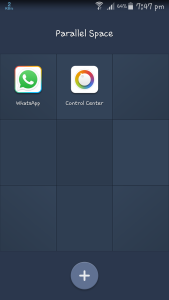 To use first account open the app available in app drawer of the mobile and to use second account click on the Parallel Space App dashboard app created earlier or you can create shortcut of the Parallel Space’s App in home screen. This is it now you are ready to use dual account of the app you want and to make it easy to understand I attached step wish Screenshots. The permission required by Parallel Space are applied by all the apps running inside it. Memory, battery and network traffic consumed by Parallel Space are actually used by all the apps running inside it. If you have any issue regarding the instruction while using this method then feel free to comment here i will try my best to resolve your problem. This was the method to run Dual Accounts in single android phone using Parallel Space. Run Two id’s in same android Phone, it is 100% working & easiest method without any error. I hope you will like this post. If you liked, then share this post via sharing buttons given below. Thank You for visiting, stay tuned with alltrickszone.com for more updates and tricks like this.